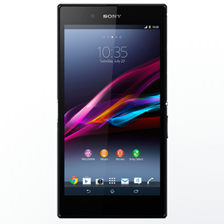 The Xperia Z Ultra is an odd proposal from a hardware perspective. The huge 6.4" 1080p screen, Snapdragon 800 processor, and 2GB of RAM say "high end," while the 8MP rear camera lacking a flash seems a bit down-market. Perhaps that has something to do with possibly tepid sales at the phone's $679 price point... and also Sony's decision to lower it. 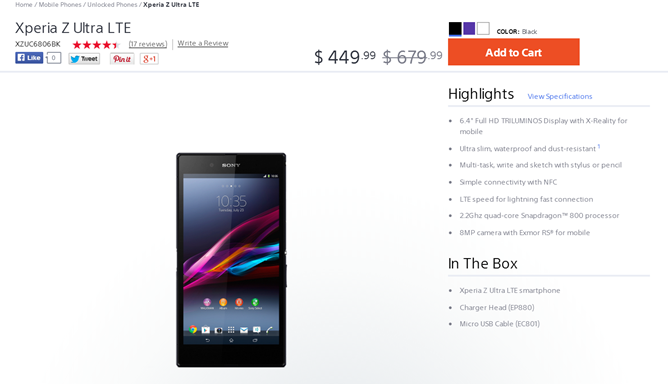 XperiaBlog reports that the price for the phone has been dropped to $449.99. That's the unlocked LTE phone sold on Sony's online store, which includes Sony's software additions on top of Android 4.4 (upgraded from 4.2). Earlier this week, the price of the Google Play Edition with stock Android 4.4 was also lowered. You can pick up a Nexus-style gigantic phablet for $449, which is pretty good, if you appreciate the form factor and aren't interested in high-end photos. Keep in mind that Sony's unlocked phones also come with unlocked bootloaders, so whichever device you choose, your aftermarket options are pretty good. Whether or not it's a better option that other Android phones at the same or lower price, such as the Nexus 5 and Moto X, is a more subtle question. Speaking as someone who's had the opportunity, try to check out the Xperia Z Ultra in person before you lay down your money - the gigantic screen takes some getting used to.